On 30 January - 2 February a mass protest was staged in the centre of Minsk as a a part of a state-sponsored film project entitled Abel. On 30 January – 2 February a mass protest was staged in the centre of Minsk as a a part of a state-sponsored film project entitled Abel. The highest echelons of the Presidential Administration are supervising the production of the film. Some observers dubbed Abel a response to Viva Belarus, a film that was shot in Poland last year. But producers claim the film will be a fictional work with only a few historical parallels. However, many things point to the fact that the film can indeed be used as a more ideological affair, made in preparations for the upcoming 2015 presidential elections. The first awkward shots, strange filmmaking team and a leaked scenario convinced many that the project might end in failure. Abel will appear in accordance with an order by the Ministry of Culture of Belarus, which has allocated $2.17m for it. The film holds the status of being a national project and Aliaksandr Radźkoŭ, the First Deputy Head of Presidential Administration, is said to be supervising it personally. The film producer is Nonstop Media, a private company that is owned by Siarhej Ždanovič, who will work with American, German and Russian partners. The producer says that the cream of the crop of foreign stunt men will participate in the film, including Arnold Schwarzenegger and Tom Cruise's respective stunt doubles. At first glance, the fact that Nonstop Media, a private company, is producing a film supervised by the regime would appear unusual at first sight. But it turns out that Siarhej Ždanovič serves as a functionary of White Rus, an organisation that primarily brings together state officials to support the regime of Lukashenka. He has connections in at the very top of the Belarusian establishment and, allegedly,has already managed to win all the tenders for the UN-financed Above the Sky film. Ždanovič chose William Devital as the film's director, who came all the way to Belarus from the US for the film's shooting. Strangely, Devital has never directed a film and worked only as a second unit director and stuntman. In his interview with the BELTA news agency he confessed that he has been working hard for such an opportunity all of his life and really feels that he deserves the chance to direct a film. Andrei Kureičyk, a famous Belarusian dramatist and scriptwriter, has extensively commented on the film. According to him, the Presidential Administration designed Abel as a response to the anti-regime Viva Belarus movie directed by Krzysztof Lukaszewich and shot in Poland. 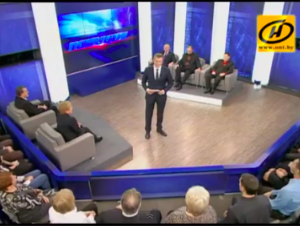 Even independent experts said that Viva Belarus showed an exaggerated picture of the regime's cruelty. Needless to say, it had a highly negative impact on the regime's already poor reputation. Kureičyk also claims that Siarhei Ždanovič created Abel to swindle some money out of the budget of the state. He promised to make an ideologically strong picture which will improve the image of the Belarusian regime internationally. It was also suggested that the film will make clear to its audience that leading up to the presidential elections of 2015 taking in protests is a bad idea. Meanwhile, on 2 February someone leaked a scripts from Abel to the Charter97 website. According to the story, missionaries form a powerful secret organisation called Cain Seal, who is trying to save the world. They know beforehand when a major assassination or murder will take place and try to prevent them from happening. One of their operations takes place in Belarus right the mass protests, where Presidential Security Service assists them in preventing some people from being killed, including saving many from a metro terrorist attack. The final scene of the film apparently even involves the Anders Breivik massacre. The producers told the media that this was one of early possible treatments of the film and the final one differs considerably from the script that was leaked. However, they do not hide their annoyance with the fact that it was indeed leaked and will even sue the person suspected to be responsible. The information which filmmakers have been publicly sharing about the project make it the film sound like it will be rather controversial. Producer Siarhei Ždanovič has constantly emphasised that the film will be fiction, not a reconstruction of the December 2010 events. In other interviews, however, he accepts that the film will cover the 2010 events, but unlike the anti-regime account shown in Viva Belarus, which was a one sided interpretation of the events. Instead Abel will show the “true” picture of the events it describes. The ideological background behind the film is evident from several other facts that have been revealed. For example, one of the scenes will cover the 11 April 2011 terrorist attack in the Minsk metro. Film director William Devital, for his part, spoke about the film's main idea in a rather open manner, clearly unaware of the film's local context. In his interview to the BELTA news agency he explained that the film revolve around dramatic events that could happen in any country: a group of hooligans and ringleaders provoke others to violence during peaceful protests. According to a majority of public opinion, it was the Belarusian security services who provoked the 19 December 2010 assault on the House of Government. By doing so the authorities tried to justify a brutal attack on peaceful protesters and their subsequent detentions and prison sentences. These events still remain a painful memory in the minds of many Belarusians today. This to say nothing of Mikalaj Statkievič, one of the presidential candidates in 2010 elections, still remains in prison. The first public filming session took place between 28 January – 2 February. It immediately raised a number of controversies and has become fodder for several anecdotes. Police in civilian clothes guarded the area where it was being to avoid journalists being able to enter and cover the filming session. Students reported that their university administrations forced them to participate in the mob scenes near the House of Government during the demonstration's filming. The mob scenes involved around 4,000 people in total according to the film's production team. Students reported that they received $4 an hour for their participation. While shooting the scenes, the film crew repeated once more again that they were not going to reconstruct the events that took place in 2010. 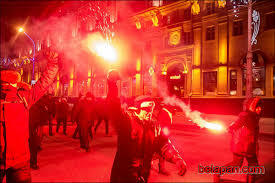 The film apparently shows the casting of Molotov cocktail at police, something that did not in reality happen during the 2010 protests. However, like in 2010, the film included the destruction of doors of the House of Government. The slogans “Viva Belarus” and white-red-white flag did not appear at the filming. Instead, the filmmakers ordered the mob to shout “We are against [the government – ed. BD]” and “Something is not right!” These phrases led to a wave of photoshopped memes on the Belarusian Internet, where the users made fun of such awkward protests. If one is to judge by the first scenes that have been shot as well as the information known about the filmmaking team, it might be fair to surmise that Abel is likely to become another failed image project of the Belarusian authorities. Foreign viewers will hardly pay for a cheap motion picture made by a group of virtually unknown amateurs. One hopes that Belarusians themselves will have enough independent thinking skills to understand where the truth really lies.